What are CeraRoot implants ? They're an array of the most bio-compatible, zir­conia tooth root replacements that act as functional foundations for crowns and bridges. CeraRoot implants are made from zirconia - a biocompatible, ceramic material that fosters complete assimilation into jaw bone. 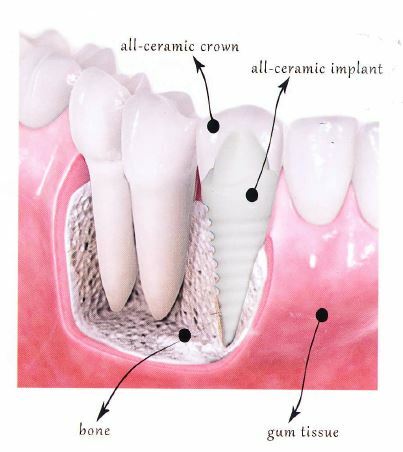 CeraRoot zirconia implants are hypoallergenic, which is not the case with metal im­ plants. Surprisingly, many cases of titanium implant sensitivity show up years after surgery when itchiness and inflammation develop around implant sites. It's a perfect setup for bone loss and the poter-itial failure of an implant. Today, there's a growing number of people who have allergies, skin sensitivities and compromised immune systems; therefore implantation of metal devices should be seriously scrutinized beforehand, especially since the removal of a titanium implant from jaw bone is not a simple procedure. CeraRoot implants do not interfere with the movement of energy through the body's meridians. And since zirconia implants are, bioinert, they're a perfect tooth replace­ment solution for patients who adhere to holistic health principles. The long-term success of CeraRoot im­ plants is one of the most important features of this innovative system. Designed to withstand tremendous masticatory forces, CeraRoot zirconia implants mimic the best of nature with a variety of tooth-like con­tours and bioinert composition. Zircon[a is well known for its durability and inflexibility under pressure...an excellent combination of traits for dental devices. Overall, CeraRoot implant patients expe­rience a shorter implant process, along with the potential for a significant increase in comfort and function afterward due to biocompatibility and the strength of zirconia. With CeraRoot, the odds are in favor of long-term success. Traditional titanium implant systems con­sist of two metal components (the implant that's lodged into the jaw and the abutment that sits above the gumline) joined together with a fixation screw. Micro-movement can occur where these pieces meet when under the extreme pressure of chewing, thus creating warm, moist places where anaerobic bacteria have an opportunity to colonize. It's a perfect setup for an unfortu­nate cascade of events to ,follow: The bac­teria release toxins, inducing inflammation around the implant, which can eventually lead to bone loss and the possibility of implant failure. Over the past decades , more ceramic components have been incorporated into dentistry due to their clinically proven stren­ gth and aesthetic benefits. 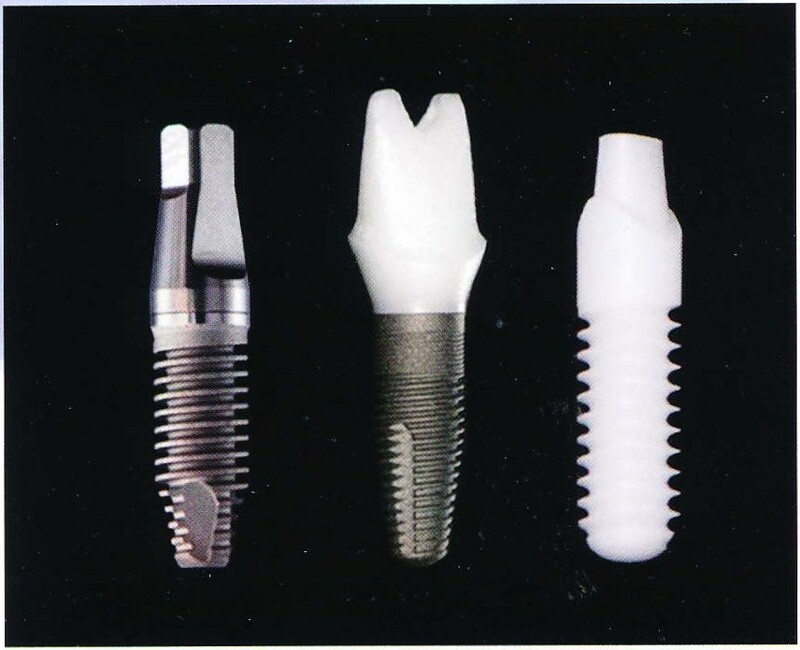 Not only is there a trend to include ceramic crowns and im­ plant abutments into a treatment plan, but the implant itself is now available in a one­ piece design made from biocompatible zir­ conia. CeraRoot implants set the stage for the ultimate in optimal function, superior health and natural beauty. Over the past decades , more ceramic components have been incorporated into dentistry due to their clinically proven stren­gth and aesthetic benefits. Not only is there a trend to include ceramic crowns and im­plant abutments into a treatment plan, but the implant itself is now available in a one­ piece design made from biocompatible zir­conia. CeraRoot implants set the stage for the ultimate in optimal function, superior health and natural beauty. 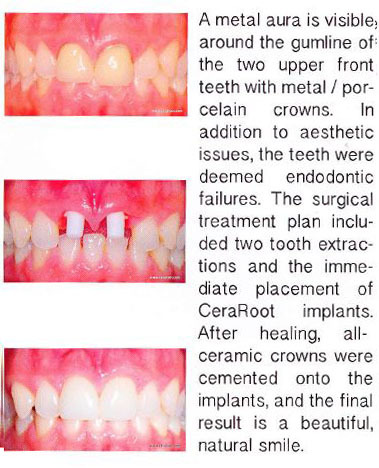 The CeraRoot implant placement is done in a one-stage approach. The implants are specially designed for the immediate pla­cement after a tooth extraction. Moreover a minimal invasive surgery may be possible in cases with no infections and sufficient ' bone where the implant may be placed transmucosally without having to make in­cisions and suture to the gum. Zirconia is biocompatible material that is resistant to chemical corrosion, nor will it conduct electricity or heat. As a bioinert material, it will never trigger chemical reac­tions, migrate to other sites in the body or interfere with the maintenance of optimal oral health. Titanium is another story. It's been scientif i­ cally proven that a titanium implant will co­ rrode in the wet environment of a mouth, especially if there is more than one metal in the vicinity (such as amalgam fillings, alloy metal crowns, bridges or gold onlays I inlays) to trigger reactions. Metal corrosion is even more active in the presence of f luo­ ride that is free f lowing in some water supplies, toothpastes and mouthwashes . It literally attacks the surface of the titanium implants. Many scientific articles have cited that titanium will not only migrate from the implant site into surrounding tissues but even into nearby lymph nodes. The f act that zirconia does not conduct an electrical charge is a big benefit. Bacterial growth on the surface of a zirconia implant is far less likely to adhere due to its non­ conductivity , thus creating an oral environ­ment that promotes much healthier gums. A recent microscopic study performed at the University of Minnesota contirmed opti­mal osseointegration of CeraRoot implants without any signs of inflammation or fo­reign body rejection. Other scientists have also reported that zir­conia is an ideal material for dental im­plants. The inherent problem that frequently arises with titanium implants is an aesthetic one. Patients with thin, translucent gums or those who are prone to gum recession (as are many aging people) may end up with the gray gums or titanium showing around the margin of the crown. Since zirconia is non-metallic and white, it is much more natural looking than titanium. It's a perfect base color that closely mimics what nature created in the first place.